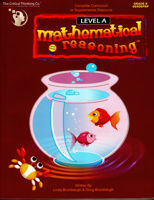 This book is a complete math curriculum for Kindergarten. The engaging lessons with easy to follow explanations, examples, and charts teach the concepts students are expected to know in kindergarten. Spiraling slowly, activities are easy enough to build confidence but challenging enough to keep their interest and build their problem solving skills. This book can be used as a textbook or a comprehensive workbook. It emphasizes problem-solving and computation to build for success in higher-level math and math assessments.